I will be turning 47-years-old in about three weeks, and lately I’ve been nostalgic about the food I enjoyed in my youth. I’m not upset about getting older, I welcome it. With each passing year, I have great experiences, and I get more comfortable in my skin. But sometimes, I long for those days when all I had to think about was what I was going to eat next. I still think about what I’m going to eat next, but along with thinking about food, I’m thinking about mortgage, car, and tuition payments. Then I think about food again, and all is right with the world. When I was a kid, salisbury steak was my absolute favorite TV Dinner. There was beef, gravy, mashed potatoes, peas, and a little brownie all on one convenient aluminum tray. It was culinary genius in my book. My mom didn’t buy TV dinners often, but when she did, I couldn’t wait to rip open a box. When I got my first job in high school, I bought a supply of salisbury steak TV dinners with my own money. I lived like a queen! Today, instead of rushing off to the supermarket for a box of hungry-man goodness, I make my own salisbury steak. 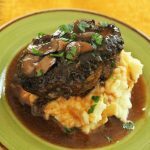 And not just any salisbaury steak, but a salisbury steak ramped up with cremini mushrooms, sweet onions, red wine, and set over fluffy mashed potatoes. It’s not a pretty dish, but it’s love and comfort on a plate, and that’s all that matters to me. Combine the ground beef, bread crumbs, onion, parsley, egg, 1 teaspoon salt, and ½ teaspoon pepper in a large bowl. Shape the beef mixture into 4 (6-ounce) oval-shaped patties, about ¾-inch thick. Heat the olive oil in a large skillet over medium heat. Cook the patties until browned, about 3 minutes on each side. Transfer the patties to a platter and keep warm. Drain the fat from the pan, reserving 1 tablespoon. Add the onion and mushrooms to the skillet and cook until tender, about 5 minutes. Season with salt and pepper. Stir in the tomato paste, garlic and thyme, and cook one additional minute. Mix the wine and cornstarch in a small bowl until combined and add to the skillet. Stir in the beef broth and bouillon cubes, and return the patties to the skillet. Bring the sauce to a boil. Reduce the heat to low, cover, and simmer until the gravy is thickened and the patties are no longer pink, about 10 minutes. Remove the thyme sprigs from the sauce. Season to taste with salt and pepper, if necessary. 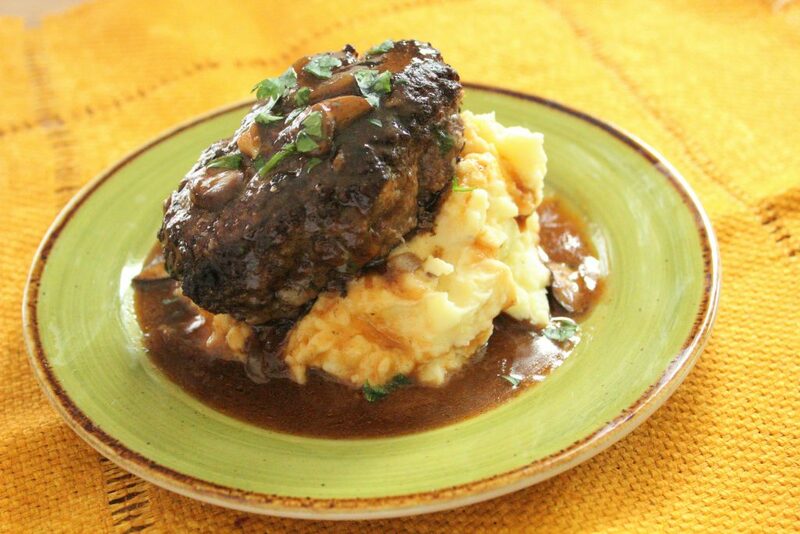 Serve the Salisbury Steak over Garlic Smashed Potatoes. 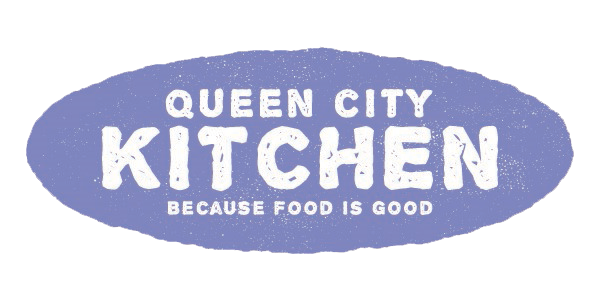 This entry was posted in 30-Minute Meals, Beef, Dinner, Entree, Recipes and tagged beef, beef gravy, comfort food, TV dinners on October 12, 2017 by Andria Gaskins.